Mashed potatoes are a Thanksgiving staple. 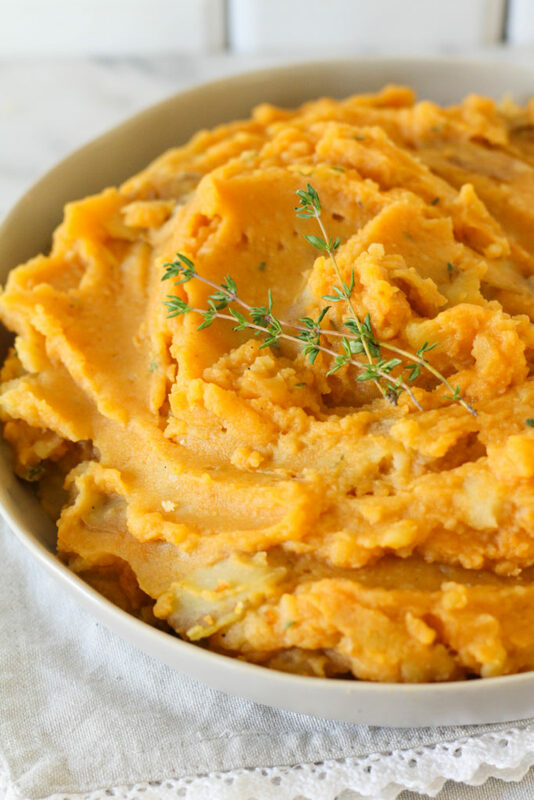 Learn how to make mashed potatoes in your Instant Pot with a special added ingredient– pumpkin! 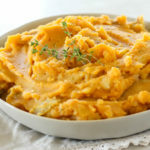 These Instant Pot Pumpkin Mashed Potatoes will be perfect for your Thanksgiving table. It’s finally feeling chilly here in Fort Worth, after a weekend of temperatures in the 90’s. Yes, you read that right. It’s hard to get excited for Thanksgiving when you’re wearing shorts and a tank top around the house. Today though, we’re in a short “cool” front– with a high of 59 today! Heh, all you northerners are probably laughing in your cozy over sized sweaters. Last week, I posted the first of my Instant Pot Thanksgiving series– Honey Herbed Carrots! Cooking vegetables in the IP is such a breeze. It takes minutes and they’re perfectly soft and flavorful. My favorite side dish to use my Instant Pot for are potatoes. It normally takes potatoes 20 minutes of boiling on the stove to reach fork-tender, however in the Instant Pot, it only takes 8 minutes. Talk about time saver! If you’ve ever been in charge of cooking the Thanksgiving feast, I’m sure you’ve felt overwhelmed. That’s where the Instant Pot (affiliate link) comes into play! Use it to cook your side dishes in half the time. If you don’t have an IP yet — be on the lookout on Black Friday, they’re usually on sale! For the next several weeks, I’ll be sharing a handful more easy Instant Pot recipes you can use for your Thanksgiving feast. Think green beans, cranberry sauce, and maybe a couple other staples you didn’t realize you could cook in the IP! Simplify your Thanksgiving this year by utilizing your Instant Pot and save time and energy. Mashed potatoes are a Thanksgiving staple. 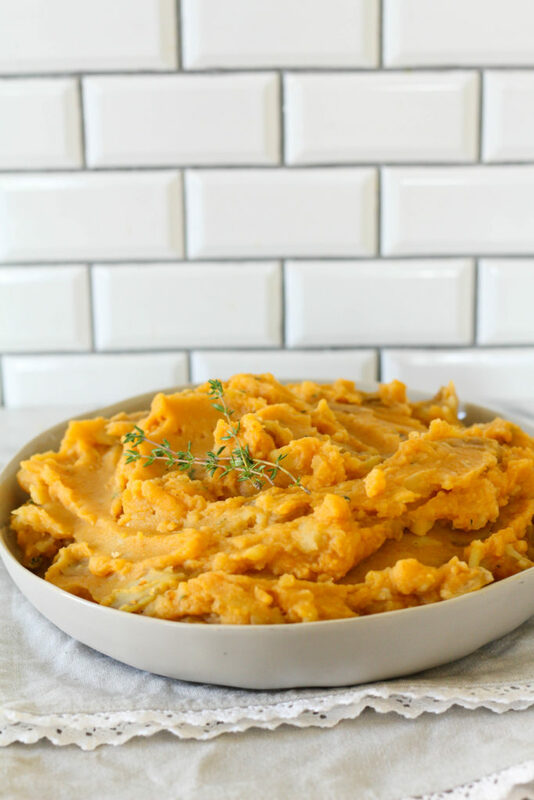 Learn how to make mashed potatoes in your Instant Pot with a special added ingredient-- pumpkin! 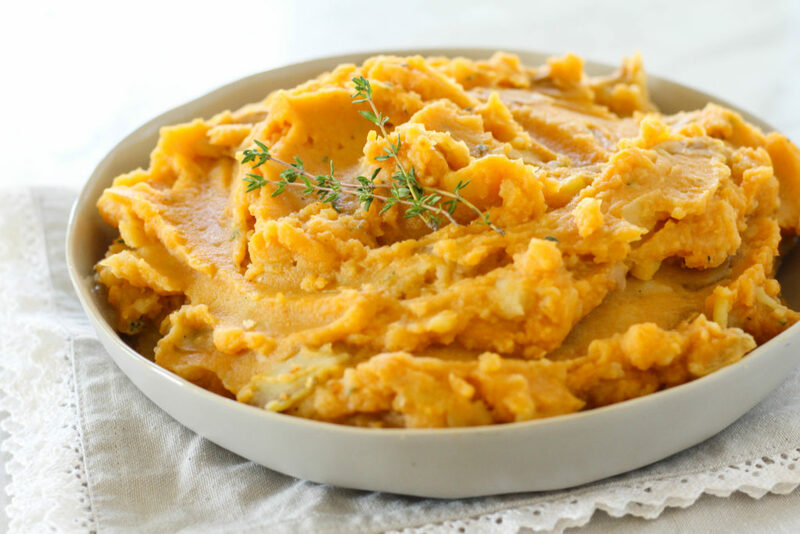 These Instant Pot Pumpkin Mashed Potatoes will be perfect for your Thanksgiving table. Place diced potatoes and broth in the Instant Pot. Lock the lid and close the pressure valve. Manual cook for 8 minutes Release the pressure immediately and take off the lid. Mash the potatoes directly in the pot and add the milk, butter, salt, pepper, garlic powder, thyme and pumpkin puree. Stir to combine. We just acquired an instant pot and I’m collecting a long list of “must try” recipes haha! This looks so good! I hope you try it! Thanks!